The Kung Fu Panda films hold something of a special place in my heart for reasons I'm not really sure of. The first was a blockbuster of an original for DreamWorks, who'd been struggling to produce a hit outside the Shrek and Madagascar franchises, signaled the start of something new. It didn't hurt that it premiered during a summer that felt rather exceptional as it counts among its company the likes of Iron Man, The Dark Knight, and Tropic Thunder. Of course, by the time the sequel came around three years later it was considered something of a disappointment as it opened to only $46 million (the original opened to $60m without the 3D bump of the sequel), but in terms of quality it was right up there with the first, if not better. Maybe the idea that since I'd ventured out to see the sequel and didn't understand the drop in anticipation made me feel as if I should hold the film more sacred (though the same is now true with How to Train Your Dragon 2), but something akin to as much happened and five years later I could not have been happier to see Po and the furious five returning. I realize how odd it may sound for a grown man whose only child isn't even old enough to go to the movies yet to be excited for an animated children's film, but much like the films of Pixar, certain DreamWorks properties have that transcendent quality where age doesn't matter. The Kung Fu Panda franchise, for me at least, is one of those. It is one of those franchises that I can't wait to share with my children in the hopes they embrace the ideas and themes these movies so boldly teach. Po has always been about defying expectations and not judging books by their covers which, in the realm of kids movies, aren't exactly new ideas, but they bring them to life in such a reverential way that it is impossible not to appreciate the craft and skill that has gone into creating a compelling narrative around such basic ideas. In the great tradition of the series, Kung Fu Panda 3 is a riveting and completely fun chapter that is gorgeous in its visual representations, effectively moving in its weightier moments, and satisfying in a manner that Po's story has come full circle and feels complete. 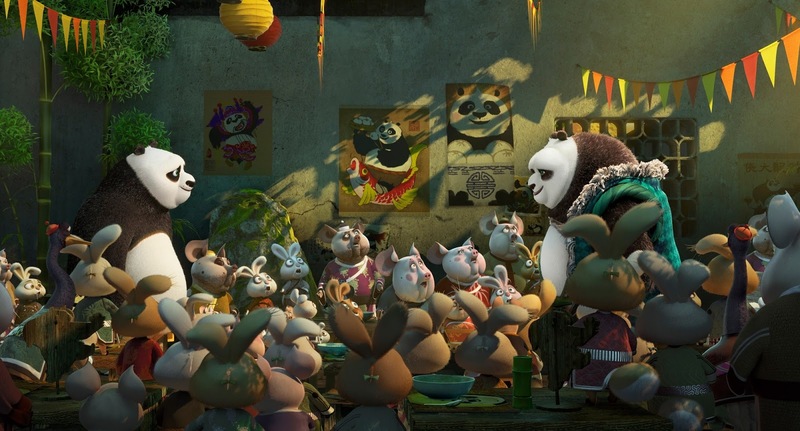 Po (voice of Jack Black) encounters Li (voice of Bryan Cranston), his father, for the first time. 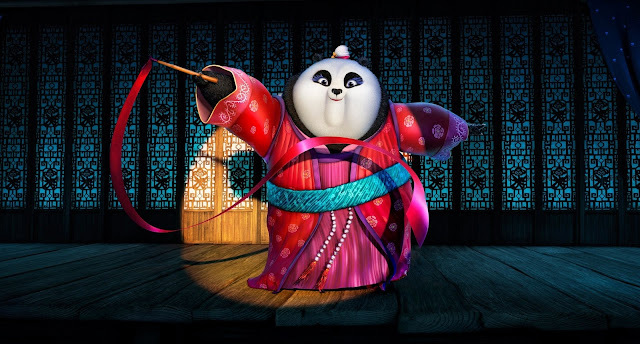 Upon returning to this world we find that Po (Jack Black) is loving his life as the dragon warrior. He has gone from being the laughing stock, noodle son of Mr. Ping (James Hong) to the most respected fighter in all the land. He is a hero to every citizen of the valley, but by the guidance of Master Shifu (Dustin Hoffman) he comes to soon realize that there is more to being the dragon warrior than kicking, punching, and high-fiving rabbits all day. Shifu is looking to move on from being a teacher to that of a master who has the power to control his "chi" and harness its power. This leaves Po, the dragon warrior, in charge of continuing to teach and further the skills of both himself and the furious five which is still composed of Tigress (Angelina Jolie), Monkey (Jackie Chan), Mantis (Seth Rogen), Viper (Lucy Liu), and Crane (David Cross). While Po is unsure if he is ready to take on such a role things are about to get especially difficult sidelining any thought of teaching being the most daunting aspect of his life. 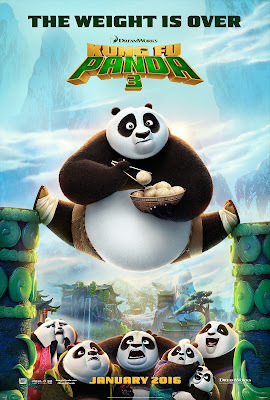 First, we are introduced to Kai (J.K. Simmons) a super natural enemy who once battled alongside Master Oogway (Randall Duk Kim) until a disagreement tore them apart and put Kai on a path of vengeance that he's been chasing for over five hundred years. Given Oogway has long since passed from the mortal realm and Kai can only exist in this same realm he is forced to capture other kung fu masters "chi's" and harness their power so that he might return to the mortal world and destroy all that Oogway created, including Shifu, Po, and the furious five. Meanwhile, after receiving a message from the universe Po's long lost panda father, Li (Bryan Cranston), finds him and offers to bring him back to a secret village of pandas. Of course, all of this begins to interlock in interesting ways thanks to returning screenwriters Jonathan Aibel and Glenn Berger. From the introductory exposition that details the history between Kai and Oogway it is clear there is going to be both a fresh, layered approach to this third installment. Freshness as we finally get to see the almost mythical Oogway finally in his element as he firmly displays the skills that brought him to the title he'd already earned when we met him in the original. Freshness because in this cinematic landscape dominated by multiverses and crossover films we forget that one of the coolest aspects of sequels is to see the expanded world of these characters we came to love in the original films. Kung Fu Panda 3 really understands this. When we finally make our way into this secret panda village it becomes clear that this will not simply be a rehash of the trials and tribulations we've seen our protagonist go through before, but rather that Po will have to face this new enemy who is creating an army from all of China's greatest kung fu masters by training a village full of his own fun-loving, clumsy brethren. Po is set-up early to make a transformation in the film as themes of potential, fulfilling that potential, and coming to be one with your true identity are all hinted at. Sure, the film again positions a big bad just as it's done in the past with Tai Lung and Shen, but as director Jennifer Yuh and her screenwriters did in the second film they again are able to come at this clichéd archetype with a unique perspective. This leads to the layers of the film. The best thing a movie that so squarely fits into a genre can do is to give the stock characters something extra, something to make them a little more complex and while successful genre films typically do as much with their heroes if there is one consistent weakness it is in the villain. While I wish Kung Fu Panda 3 would have done more with Kai, there are some real textures here that make this warlord a formidable foe. Kai possesses a real vendetta against Oogway and possibly even a fair one were we to be given more detail into their backstory. If a different perspective were taken it wouldn't be hard to see why Kai is so angry that his achievements have left no legacy whereas Oogway will forever bask in the glory that was brought to him by what he refused to share with Kai. Mei Mei (Kate Hudson) is the worlds best ribbon twirler according to Mei Mei. Once again, I realize how odd it may sound for a grown man to find such appreciation in a children's animated film, but there is a lot of respect deserved here. As Po's parentage has always been something of a mystery it is nice to finally see this aspect of our heroes facade addressed. The film does well to detail the dynamic between Po's biological father and his adoptive father which was always going to be interesting given the over-protective nature of Mr. Ping. As Li, Cranston demonstrates his earnest yet commanding presence through his vocal performance as his newly introduced father figure is immediately trustworthy and rather humble. Li is the guy who always knows the right thing to say and doesn't make any situation weird or awkward, but rather has enough perspective to embrace such fun as running through a temple with rhino armor on. He's making up for lost time with his son and that investment pays off when he convinces Po to return with him to his village. Just as Li hopes Po will do, we are settled into this new setting and new lifestyle by the forty-five minute mark which is the perfect time for the story to begin taking us places we didn't necessarily expect. Which, thankfully, it does. Connecting to both the first and second films in natural ways it uses these predetermined factors to provide some of the emotional substance. To say anything more might be considered spoiler-ish so I'll remain vague, but I was genuinely surprised by the emotional heft that is conveyed through the father/son dynamic. While I still wish the film might have found a better way to integrate the host of supporting characters, especially the furious five, into these emotional moments there is obvious efforts being made to do as much with the soundtrack from Hans Zimmer and Lorne Balfe only aiding in such moments. Kai's theme is especially ear-catching. By the time we reach the final twenty or so minutes we've been treated to an unexpected turn in the narrative and a beautifully rendered montage showing how our heroes might overcome the inevitable arrival of Kai. As with the first two installments, the fight scenes are immensely creative and only serve to further solidify the top-notch quality of the animation. On the big screen, it is truly and magnificently gorgeous. The detail in the close-ups of the many panda's claws is striking enough on their own, much less the immersive worlds the animators take us into. And while this entry may not be as consistently funny in the broad strokes it includes enough humor in the details and in Black's vocal performance that the humor is nowhere near disappointing. The pacing is strong and nearly flawless with the brief ninety-minute feature never stopping to ogle itself and even seems to have cut a storyline concerning Po and a possible love interest in Kate Hudson's ribbon twirling Mei Mei. Part of me is glad they did. Sure, Po needs love, but this movie is about a different kind of relationship for our hero and to distract from that would have felt unnecessary. Po has always been an intriguing lead because of his innocence and awe of all that is awesome no matter how dire the circumstances. In many regards, his naiveté makes him all the more endearing as he cuts through any tension with this sense of wonderment. That this vital characteristic remains intact here even as the character goes through some life-changing experiences is reassuring as its clear that through this odyssey the filmmakers have come to fully form this character. With his arc finally coming full circle in a strangely moving and spiritual fashion we are seeing the great fruits of the filmmakers labor. If Kung Fu Panda 3 is indeed the last time we see Po and his gang on the big screen this franchise would be going out on a high note with a fitting conclusion that will allow it to keep hold of that special place in my heart.